Bry-Air, Inc. environmental control systems allow for consistent control to efficiently prevent the effects of humidity, such as corrosion. When moisture in the air condenses onto cold pipes, valves, and pumps, a number of destructive effects can occur. High humidity resulting from a damp environment can cause corrosion of metal, deterioration of paint, and failure of electrical components. Sanitation also becomes a concern when a moist location acts as a breeding ground for the development of bacteria, fungus, and molds. Typically water and wastewater treatment facilities are designed to avoid contamination and corrosion in the pipes. Any contamination of water which could be consumed by humans or animals is carefully avoided. However, the condition of the outside of the pipes may be very different. Condensation will occur any time the pipe or valve surface temperature is below the dew point of the surrounding air. This condensation and subsequent corrosion problem generally takes place during the spring, summer, and fall months. In more humid climates the problem may be year-round. In the past, one solution to this problem was to use a refrigeration type dehumidifier to remove moisture from the air. This method, at first, appears to be attractive because of the low cost and easy availability of residential and commercial grade refrigeration systems. In the summer months, this type of system is somewhat effective because the air temperature and dew point are high. However, as these units operate by cooling the air to condense its moisture, their drying capacity is limited when the air is already cool. Many residential and commercial refrigeration units cannot adjust their cooling capacity. Thus, they over-cool the air, eventually freezing the moisture that condenses on the cooling coils. Once this occurs, all beneficial dehumidification stops and the coils must be defrosted. This is the reason that refrigeration units are effective in the hot summer months but not in the cooler fall and spring months. A Bry-Air, Inc. desiccant dehumidifier can provide year-round consistent humidity levels regardless of the season. There are no coils to freeze up and a humidistat guarantees warm dry air, on demand, regardless of ambient conditions. For example: Pipe tunnel – total volume is 100,000 cubic feet, including pipes, etc. – then 100,000 cubic feet divided by 25 equals 4,000 CFM of dehumidified air required. Additional expenses for painting, curtailing rust and other problems brought on by high humidity can cost a typical water treatment facility from $10,000 to $50,000 per year. Problems such as sweating pipes, rotting of insulation or pipe coverings, pitting of electrical controls, added electrical motor maintenance, drips and puddles are but a few that can occur. In most cases, the cost of a Bry-Air, Inc. dehumidifier installation will pay for itself in two years or less by reducing these problems and the associated maintenance that goes along with them. As an added savings, gas can be used for reactivation and a heat recovery coil can also be included. A heat recovery coil can reclaim up to 60% of the reactivation exhaust heat. Some sewage plants have gas available as a by-product. 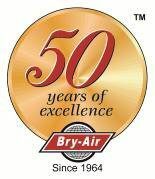 A Bry-Air, Inc. dehumidifier, located in the pipe gallery or other area of high humidity, can maintain a range of 20% – 45%RH year round which completely eliminates condensation and sweating. This is accomplished through re-circulation and there is no need for make-up air. In addition the use of an after-cooling coil can be omitted in most installations since the warm, dry air from the dehumidifier helps to heat the tunnels and pumping areas in the winter. Warm dry air is usually not objectionable in summer, since few people work in these areas regularly. This source of heat is an added advantage of the Bry-Air, Inc. desiccant dehumidifier, because the relative humidity is lowered and the capability of the air to carry away moisture is increased. Since our inception, Bry-Air, Inc. has sold many desiccant dehumidifiers to water and wastewater treatment facilities all over the world and in every state of the U.S. 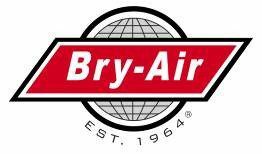 Engineers frequently, look to Bry-Air, Inc. to provide them with years of trouble free, efficient performance.